COBLESKILL - To say it was a difficult season for the SUNY Cobleskill Women's Basketball squad, who won only two games this year, would be an understatement. However, even the team's darkest moments over their twenty-three game schedule had a silver lining. That silver lining being forward Shelby Preston. 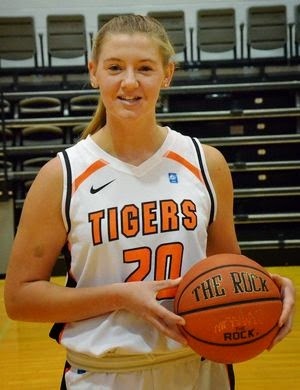 Standing tall at five feet eleven inches with a determined but kind gaze, the Sophomore described the Fighting Tigers poor 2014-15 season record as "really frustrating," although personally she menaced opponents on the court offensively and defensively. Averaging 16.7 points, 15 rebounds, and 33.9 minutes per game, Ms. Preston often served as the team's anchor. An anchor that was necessary with only four players returning from the previous season and the team having to adjust to a new coach. Preston's performance on the court was substantial enough to earn her All-NEAC Third Team honors for a second consecutive season, but her focus never strayed far from the team. Walking into a new season with two new coaches at the helm, Ms. Preston explained that she and her teammates "didn't know what to expect from the start," and that a significant amount of time was invested into figuring out their coaching styles in the beginning. Still, the forward thrived on the court. Saying that it came to her this year after working hard in the summer and improving multiple aspects of her game over the offseason, Preston downplayed her own accomplishments this year in favor of those yet to come. Although unsure about the team's direction under coach Phil Knapp moving forward, Ms. Preston - a Communications major - is intent on returning to the court next winter, of which she commented, "I hope next season is a lot better."